U.S. Patent No. 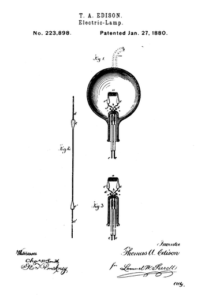 223,898 for Electric Lamp issued to Thomas Edison, 1880. For many businesses, a strong patent portfolio provides a significant competitive advantage. Under the U.S. Patent Act (35 U.S. Code) inventors must submit a patent application to the United States Patent and Trademark Office where it will be reviewed by an examiner to determine if the invention is patentable. If issued, U.S. law grants patentees the right to exclude others from making, using, or selling the invention. The U.S. Patent Act states that processes, machines, articles of manufacture, and compositions of matter are patentable subject matters. Protection of patents includes strict compliance with filing deadlines and confidentiality requirements during early stages of invention, in addition to analysis of the scope of the invention. The statutory bar of timely filing a patent application in the U.S. can be unforgiving, and vary in international countries. Unintentional public disclosure of an invention without a confidentiality agreement may result in a complete loss of patent rights. 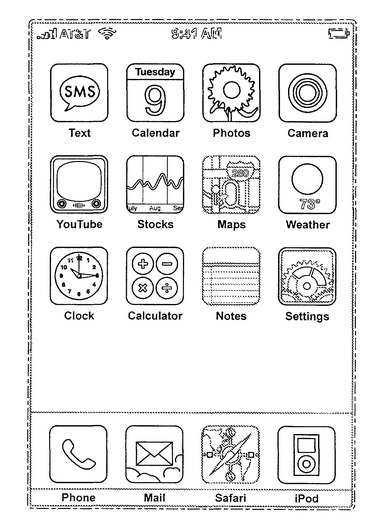 “Big Dog” U.S. Patent No. 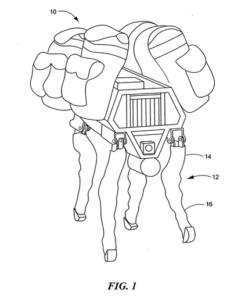 20120291873 for Hydraulic Circuit issued to Boston Dynamics, 2011. L.A. TECH & MEDIA LAW FIRM provides comprehensive patent law consultation and services to technology companies, startups and innovation firms, including patent drafting, prosecution, litigation, and licensing. Our Los Angeles patent attorneys communicate and interact with the U.S. Patent and Trademark Office on a regular basis, and are highly experienced in preparing concise and effective patent claims, and researching and writing opinion letters on patent issues. 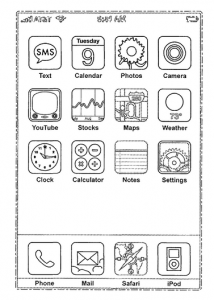 Graphical user interface for a display screen, US D644239, 2007, Apple Inc..